What Beer Pairs Best with Mashed Potatoes and Gravy? Details: Mashed potatoes topped with turkey gravy. 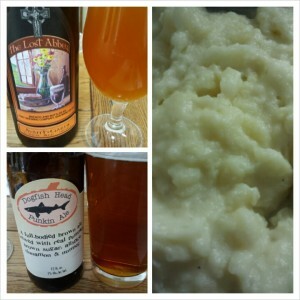 The beers were good, the mashed potatoes were okay, the two together were okay. This is the third post in our series about what beer pairs best with Thanksgiving dinner. In the first post we discussed what beer pairs best with turkey and the second post covered what beers pair best with stuffing. Since we are pairing with the same two beers we’ll skip the beer specific piece and cut right to the food and pairing part of it. You can refer back to the first post about turkey for the specifics on the two beers. The mashed potatoes and gravy were only okay. Typically, mashed potatoes are the best part of Thanksgiving. The low rating for these mashed potatoes is really no fault of mashed potatoes in general, it’s just this particular batch seemed a little too chunky and not quite fluffy enough. The big question is: how was the beer with the food? To answer this, let’s tackle these two beers separately. How was the Avant Garde with the mashed potatoes? The answer is: okay. The gravy seemed to take away from the balancedness of the beer. I wouldn’t say it ruined the beer but the beer was definitely better off without the mashed potatoes and gravy. How was the Punkin Ale with the mashed potatoes? The answer is: good. Like most of the other pairings with the Punkin Ale, it tasted good yet neither flavor changed. So, the answer to the original question of what beer pairs best with mashed potatoes and gravy is: Pumpkin Ale. Try and get some Dogfish Head Punkin Ale on hand to pair with your mashed potatoes or a different Pumpkin Ale if you have no luck finding that one. ?The J2 rating is the TapThat rating given by the founders. It is based on a scale of 1-5, 5 being the best. What Beer Pairs Best with Pumpkin Pie? What Beer Pairs Best with Thanksgiving Stuffing? What Beer Pairs Best with Thanksgiving Turkey? Copyright © 2019 TapThatBeerApp.com All rights reserved.